Life is much easier if I plan out the meals for the week ahead of time. Now life doesn’t always go the way I planned it, so I allow for a couple of meals where I only have 15 to 20 minutes from the time I get home until the time food is on the table. It’s all about the preparation. When I sit down to plan, I often choose a couple of new recipes to try. Nothing too complicated because I’m usually tired by the time supper rolls around. I have several favourite web sites: whfoods.org (really easy, fast and healthy recipes), 101cookbooks.com (these are a little more challenging, but always delicious), nourishingmeals.com, domesticaffair.blogspot.ca – and several favourite cookbooks: Get it Ripe by jae steele, Enlightened Eating by Caroline Dupont and refresh by Ruth Tal are my top three at the moment. From these recipes write out all of the ingredients – and make a list of what you need to get! The easiest way to go grocery shopping and not forget half of what you need is to create a list – checking it against what you already have in the pantry. 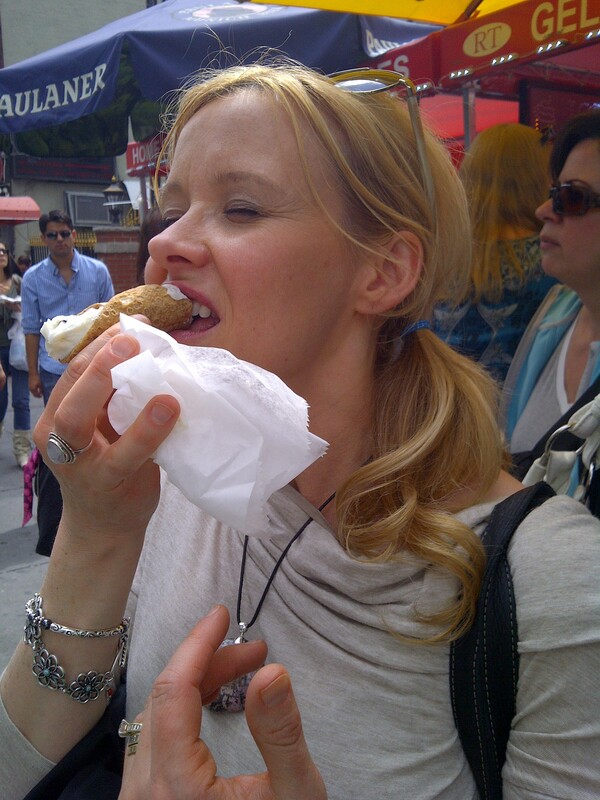 I find if I have a list, I’m more focussed and not as easily swayed by tempting prepared foods and treats. Unpack everything and put the dry goods away. If you buy in bulk, transfer to mason jars for ease of use. I keep all of my flours, grains, nuts and seeds right where I do my food preparation so I have them right at hand. I put most of the bread in the freezer, taking out only what we will eat in three days. That way it doesn’t get wasted. Greens – wash and tear what you are going to be using for salads in the next couple of days. I usually put them in the salad spinner and spin them just once, leave the water in the container and put the whole thing in the fridge. My family uses more than a spinner full per day so I put the separate greens in a vented bag because they take up less space. If they are going to be there for more than a day, wrap them in wet towels. Carrots – I usually wash and chop in large coins about 4 carrots, cut some into snack-sized pieces and grate 4 carrots in the food processor. I put them in separate containers and store in the fridge. Sweet peppers – wash and chop half at a time into small enough pieces to throw into an omelette or salad at a moments notice. Cut the other half into snack-sized pieces for dipping. Celery – wash, chop into snack-sized pieces, dry and place in a container. Cruciferous vegetables (broccoli, cabbage, cauliflower, bok choy, etc) – chop into serving sizes, wash, dry and store in container. Beets – I love beets and they are delicious grated in a salad, or throw a handful into your green smoothie. Grate some up after you’ve done your carrots and put them in a separate container. Squash, turnip – I put off these until the last because I find them so hard to work with but peel them, cube them and store in container. Do it now or you won’t later! Asparagus – wash, snap stems wherever they break and store upright in a glass of water. Somehow these always get knocked over in my fridge so push them to the back where they are out of the way but not out of mind! Fresh herbs – make sure they are dry before you put them away, then wash only when you are about to use them. They don’t like to be prep’d ahead of time. Parsley/cilantro – wash them, dry them, cut off the tips of the stems and store upright in water, lots of water. Garlic – press a whole bulb at a time, that way you’ve always got it ready. Store in a jar. Sprouts – I usually leave them in the carton they come in. They are so easy to make yourself and the kids enjoy watching them grow. So now that you’ve got everything ready to go, adding vegetables to your meals will be easy and quick. I came across a great resource – The Periodic Table of Produce from Simple Life, Fall 2006 and here’s a link where you can print it out: http://www.slashfood.com/2006/09/22/periodic-table-of-storing-produce/. Slashfood is also a great recipe resource, just beware of the sugar content in some of the recipes! A great way to get your daily dose of essential fatty acids (EFAs) for healthy cell membranes and immune function (among other things) is with a tasty dressing to pull all the flavours together. Here are a couple of quick and easy recipes. Mix everything together in a jam jar. Stores in the fridge for up to one week. Mix everything together in a jam jar, then pour on salad! Throw everything into a blender, in opposite order. You can use a sieve to remove most of the fibre, or leave some to help with digestion. Why are you sighing you ask? I just wrote this – and hit Publish – and it disappeared! Where do unpublished blog posts go I wonder? Does anyone ever see them again? Who knew that if you leave your laptop overnight and DON’T actually post your post something happens and it becomes unpublishable. Deeply saddening! 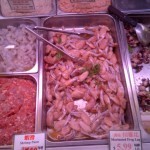 Luckily, Chinatown was not a sad place. Look at the beautiful colours and textures to the left. 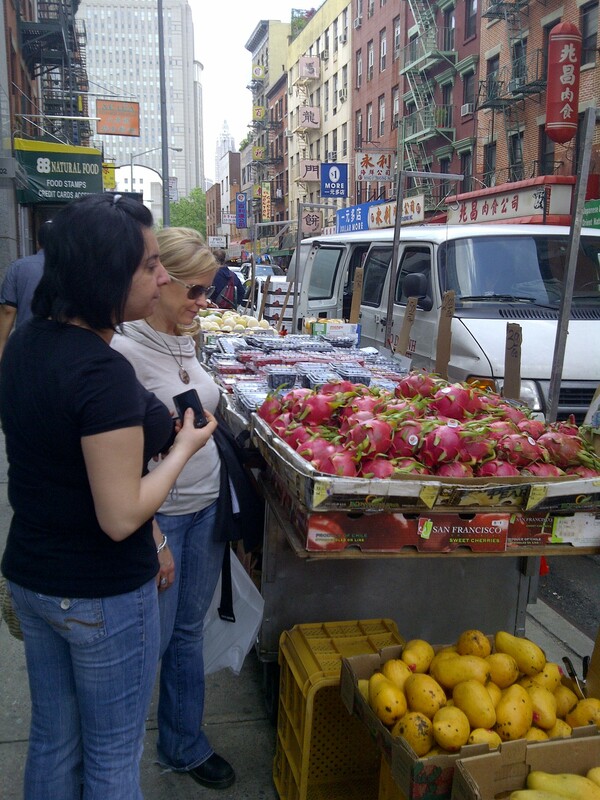 This is a common sight in NYCs Chinese section – and further along you find vendors selling wonderful vibrant vegetables and fruit (who can resist a pink and green dragon fruit? ), origami sculptures, bonsai, and brightly coloured toys. It is one of the oldest ethnic Chinese areas outside of Asia. Our five hour tour started with a visit to an underground shopping mall where you could purchase any body part of an animal you can imagine. 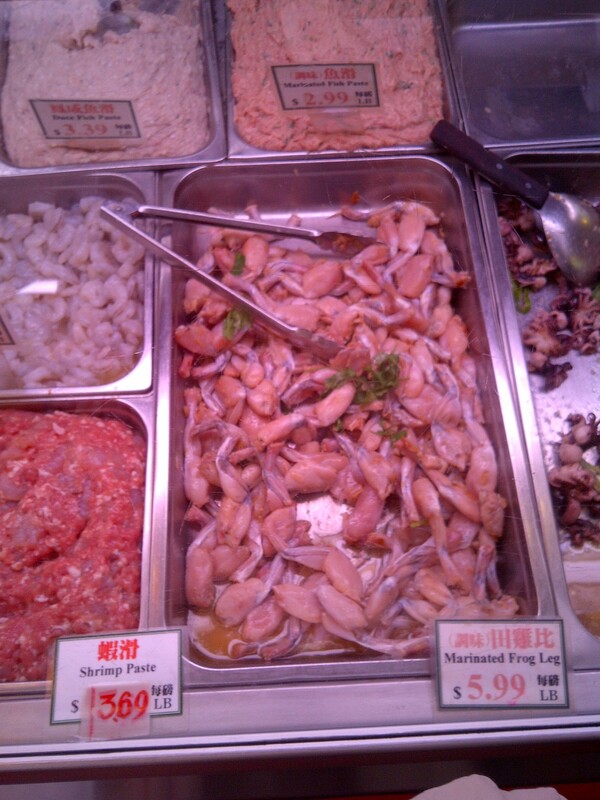 The Chinese use every part of the animal for cooking and eating – from marinated frogs legs, chicken feet, black chickens (apparently their feathers are white and fluffy, but their skin is definitely black) and all internal organs, you can purchase them here. 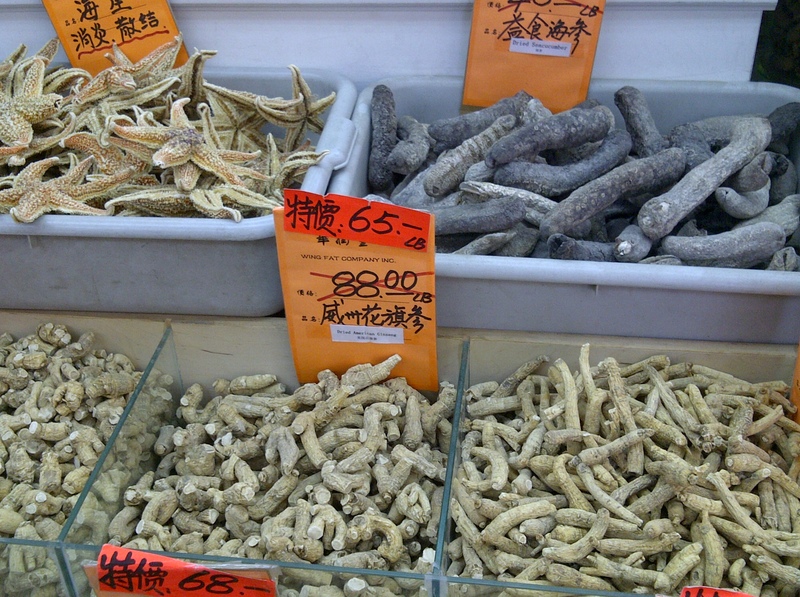 From here we found several dried goods stores where we found all kinds of things I wouldn’t even have thought could be dried – like sea cucumbers and starfish. These coconut curls though would be beautiful on a chocolate, coconut cake I’m thinking. Maybe I should come up with a recipe. No doubt the Chinatown here in TO will be able to provide the curls. That’s one of the things I realized. We have a thriving Chinatown here in Toronto, and I never visit it. I got so many ideas for foods that I would love to try and experiment with from NYC and could probably have had the same, or a similar experience at home. So often, we get in a plane to experience something that’s in our own backyards. But it takes a plane ride for us to see it! 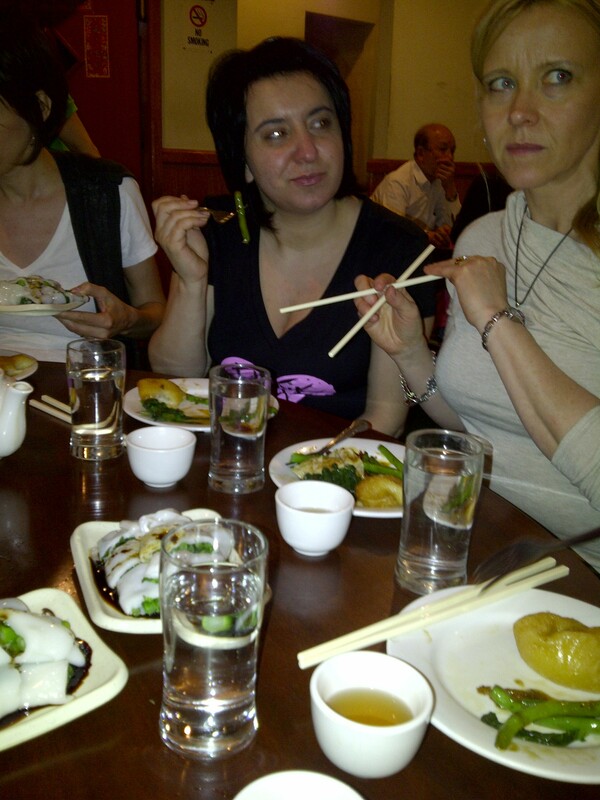 The group experienced Vegetarian Dim Sum together. I’m not certain that I would do it again. 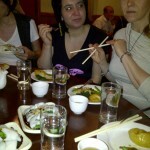 I’ve had Dim Sum before and have a texture problem with the custard like quality of the food. 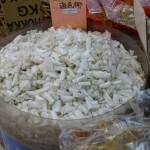 Don’t get me wrong, I LOVE custard – but not when it’s made with rice flour and warm and gelatinous and a little greasy. 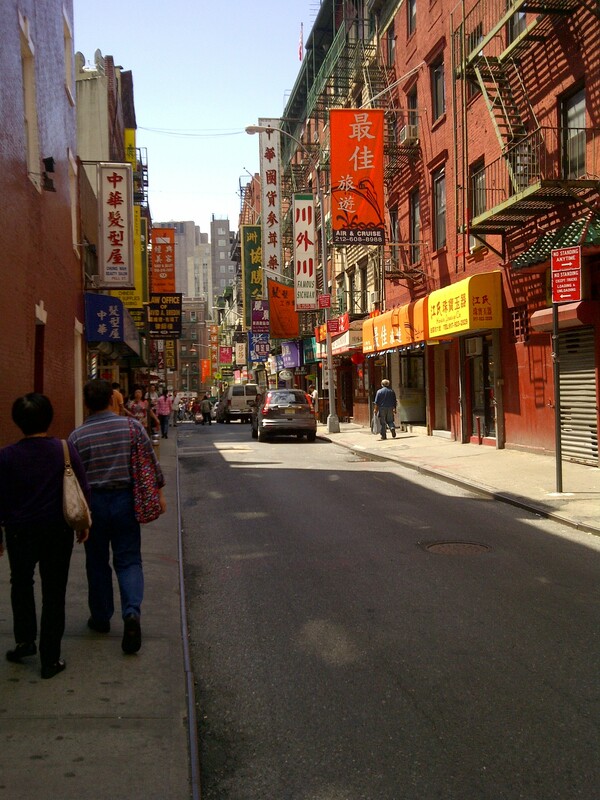 After spending the morning and the early afternoon experiencing the sights, sounds, smells and tastes of Chinatown, we walked across Canal Street to Little Italy. It may only be one street long, but there’s lots of Italian flavour let me tell you – and amazing that it’s just across the street from Chinatown! Sherri tried her first Cannoli and we found a little Italian restaurant that served delicious pizza – fresh tomatoes, mozzarella cheese and basil. Ohhh – it was so good. It could have been made more delicious by the margaritas that were served along with the pizza? And the umbrella protecting us from the rain? And the good-looking Italian men in the restaurant? Nah – it was tasty. Sometimes the really simple recipes are the best. Once recipes get too complex, the flavour gets lost. 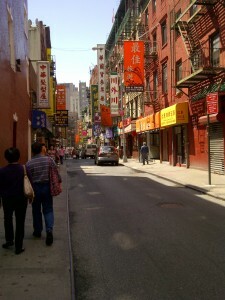 Here is where we started walking – after we found a restroom, which is not an easy task in Little Italy! We walked to Soho in search of a store selling Doc Marten’s for Sherri – at Spring and Green. Next time I come to NYC, I’m starting my shopping here. It’s so pretty with lots of tiny little one-of-a-kind boutiques that I would love to have browsed through. Unfortunately we had dinner reservations so had to keep moving. Those reservations were being held at Blossom of NYC. Weary and wet again – we picked a rainy weekend to discover the joys of New York – I had a delicious mixed field greens salad with a sweet potato filled ravioli topped with pine nuts. This meal was made even better by its proximity to Cocoa V where we went for dessert – lots of decadent chocolate. Who could ask for more? Oh yes – it was close to our hotel! Our last day was Sunday – so we needed a great Sunday brunch spot and found that Sarabeth‘s at Central Park South is THE place to be in New York City for brunch. After a decidedly fluffy breakfast of eggs and scones – and delicious jam I might add – we went for a walk through Central Park and along 5th Avenue. Before we knew it, it was time to fly home to beautiful TO. Until we return NYC and Natural Gourmet Institute. In a large pot (one gallon large), heat the milk and cream to 100°F. Add the salt and continue heating, stirring occasionally to prevent scorching, until an instant read thermometer reads 185°F. Add the lemon juice and gently stir. The lemon juice causes the milk to separate. Reduce heat to really low and cook until curds form (about 1 minute). Do not let mixture come to a boil. Remove from heat and let stand for 5 minutes. Line a sieve in a bowl with damp cheesecloth and gently ladle curds into the cloth, letting it drain for an hour. The longer it sits, the harder it becomes. Transfer to container and refrigerate. Will keep for up to 5 days. We had a wonderful, whirlwind tour of NYC this weekend that included a Pasta cooking class at Natural Gourmet Institute and a walking (and eating) tour of Chinatown. I’ve got lots of photos and a recipe to follow – but first the details! Before we begin, I want to apologize for the fact that there are no photos of me. It seems that if you remember to bring a camera, then you become the biographer rather than the subject of the biography! Anyway, there are very few photos of me because I often remember my camera! Enough said. We arrived in NYC on Thursday afternoon and spent the afternoon walking toward the Theatre District and visited Times Square (this was quite a hike from our hotel at W 29th and 7th Avenue – the Holiday Inn Express). About 5 o’clock in the afternoon we walked by the sign for Wicked and decided that we would try and get cancelled tickets. We quickly managed to get 2 tickets but were waiting on a 3rd when something wonderful happened. There was a lottery called for 13 spots in the front row! Who knew? So Sherri and I left Pina in the line-up and put our names in the lottery along with 100s of other people. There were a lot of people trying to get these tickets! Anyway, I won a ticket and for $26.25 I was able to watch ‘Wicked’ from the front row. To celebrate, we walked down to Xia Xia, a South African restaurant for a Margaritta (I know, you don’t usually associate the two – but they were on sale for $4 there and we couldn’t resist). Along with the delicious margarittas, we tried Goat Cheese Stuffed Pepperdaw Peppers which are delicious mildly spicy peppers from South Africa. Got to try and find them here – does anyone know where I might find them in Toronto? With the pepperdaws, we had Oven-roasted Asparagus with Melted Brie in an Orange Honey sauce. I’m thinking that the name should say it all. It was fabulous. Melted brie topped with asparagus tips served with an orange-honey sauce that would have been even better if the orange was a stronger flavour. When I try it at home, I think that I’ll try zesting some of the rind to punch up the flavour. The next day was Friday, and we spent the day shopping. It rained all day so we literally ducked from one store into the next. But a few shoes managed to find their way into my suitcase as well as a raincoat and matching scarf. Our destination for lunch was Angelica’s Kitchen on E 12th street. I can’t remember what we ate exactly as I didn’t take notes nor did I take photos (hey, it was raining, we walked many, many miles and my feet were wet and blistered – I was not in my happy place!). We started with the soup of the day which was potato and leek with an arugula sauce on the top. It was a beautiful white soup with a swirl of green on the top. After that, we asked the waiter for help (I think we were all in the same ‘gloomy cloud’ place and so hungry and thirsty we couldn’t really make decisions) and he suggested that we try the Pantry Plate with hummus, a simple salad, and garlic lemon marinated kale. It was tasty – to finish off the hummus we tried some of their Sourdough bread which was a good idea as we didn’t want to waste any! By this time we needed to head back to the hotel and dry off before our Pasta class. I have to admit that I was feeling so exhausted that the idea of standing for the next 4 hours filled me with dread. Yeah – I had come all of this way for this one class and I just wanted to go to bed with my feet suspended high above me. And I thought those boots were made for walking! 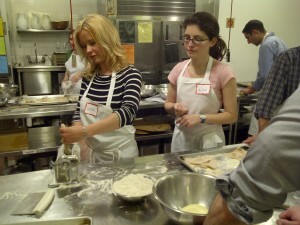 Despite my trepidations and my aching feet, off we marched to the Natural Gourmet Institute to learn how to make pasta. And let me tell you that I’m really glad that I did. We had a blast! Chef Richard LaMarita was so knowledgeable, not just about the food but he had learned how to make it by traveling around the area and learned from the locals. Can you imagine? I would so love to do that! Look out world, I’m going to join the ranks of traveling food writers! I just want to eat everywhere really. 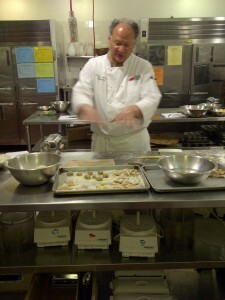 Here’s a shot of Richard showing how to make the pasta and get it ready for cooking. Note how his hands are blurred? That’s because he talks with his hands too! 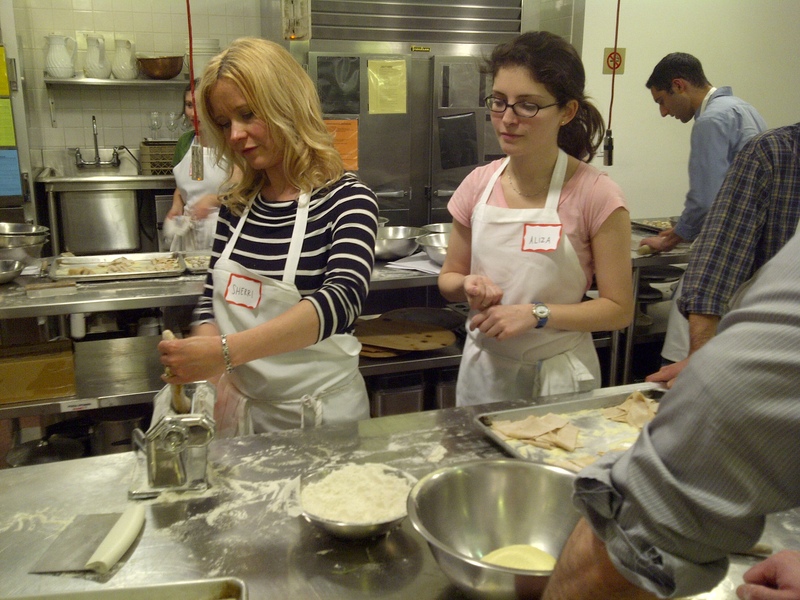 We made delicious sauces too, then came the exciting phase – rolling out the pasta dough! Here’s Sherri showing you excellent technique! That’s Aliza helping out because Sous-chef Rebecca chose this moment to take some photos. She and Daniel worked on the same recipes as we did – so we were a little competitive. Thanks for the ribbing you two! Enough writing for today. All these food ideas has made me hungry so I need to go and think about what’s for supper. I’ll tell you all about Chinatown and Blossom tomorrow. This way you’ll get two recipes instead of just one! This was our favourite recipe – Rye Gnocchi with Sage Butter with grateful thanks for sharing it with us to Natural Gourmet Institute and Chef Richard. Preheat oven to 400°F. Pierce the potatoes all over with a fork and place on a baking sheet covered with kosher salt (you want the potatoes to dry out, so cover the pan well to absorb all of the moisture). Bake potatoes for 1 hour, or until for tender. Set aside to cool until warm, not hot. While the potatoes are still warm, scoop out flesh from the skin. 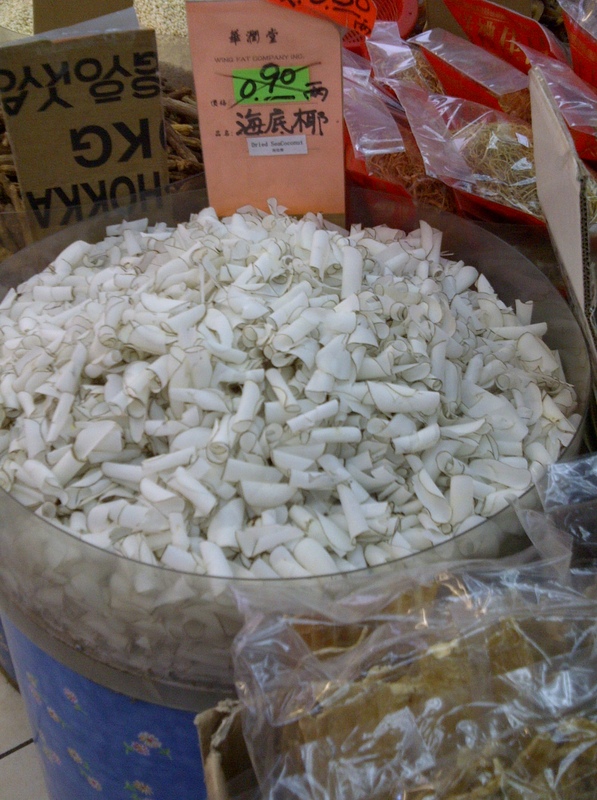 Pass them through a ricer and place in a bowl. Be sure to keep the potatoes as light and fluffy as possible, ensuring a light gnocchi. Add the egg yolks, salt, pepper, ground caraway seed and just enough flour to create the dough. Do not overwork it, add just enough flour to make it come together. Do not knead. 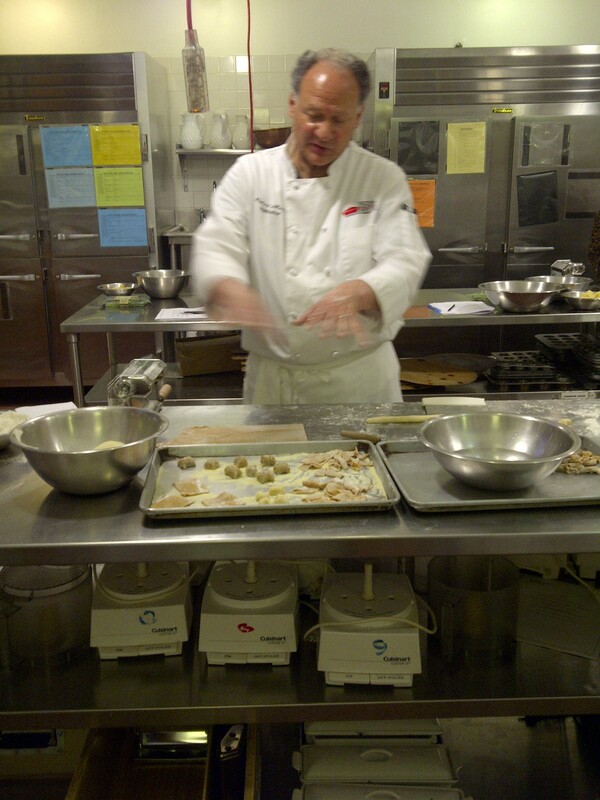 Cut the dough in half and roll into cords about 1.5″ thick. Cut off pieces about 3/4″ long with a pastry knife. Set aside on a baking sheet sprinkled with rye flour. Gnocchi can be frozen at this point. Place the gnocchi into boiling, salted water. Cook until they float and start to swell slightly (about 1 minute after they float to the surface). Undercooking the gnocchi will make them heavy. Overcooking them will make them tough. While gnocchi are cooking, melt the butter in a pan just until it begins to brown. Quickly take the pan off the heat and toss in the sage leaves. Season with salt and pepper. Take gnocchi out of the water (we used a large spider scieve) and place right into sauce in pan. Toss to fully coat. Serve sprinkled with parmesan cheese and garnished with sage leaves. 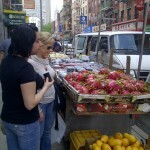 Tomorrow morning I’m off to New York City to take some classes at the Natural Gourmet Institute. 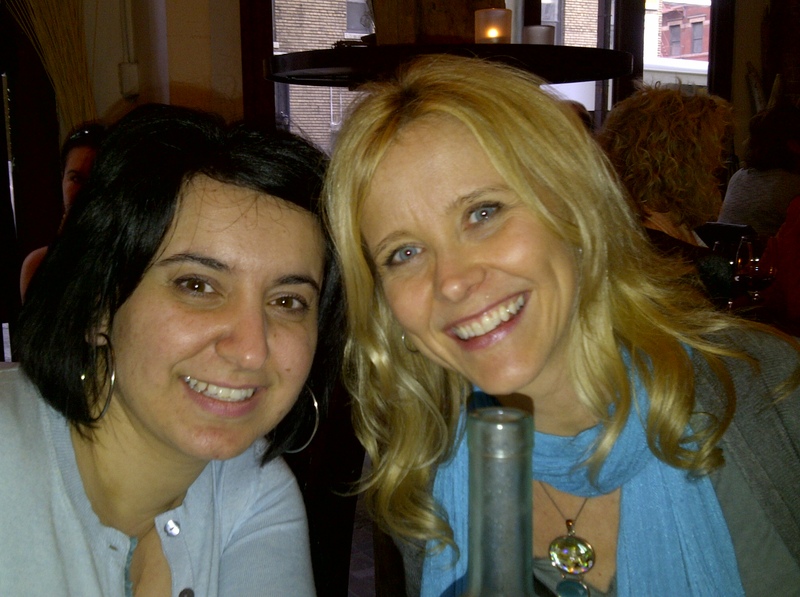 I’m going with Sherri Doak and Pina Constantinos from Nature’s Emporium and we look forward to learning how to make some delicious food as well as visit some of the places we’ve been reading about. Saturday night we’ll be eating at the raw food restaurant Pure Food and Wine. 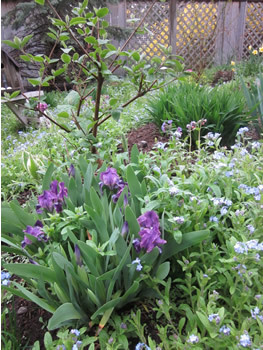 I promise to post lots of details and will take some photographs too (but for now, here’s a photo of my post rain flower-filled garden). We were disappointed to find out that tomorrow night’s class has been cancelled due to lack of enrollment. 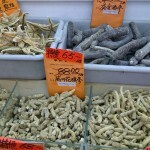 Too bad – NYC is missing out on some serious information about Spices, the key to a delicious meal in my opinion. 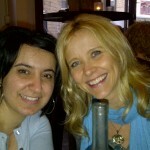 Hopefully we will be able to attend the Seitan class instead but there is a waiting list. Failing that, I’m certain that we’ll find something to see and eat in New York! Who knows, we might even be able to do some shopping too! Last night we went out for supper to celebrate my daughter’s passing her driving test. She wanted to celebrate – I needed a drink!! There are some delicious vegetarian options available at restaurants now – even the Roadhouse style restaurant. I found a tasty whole wheat pasta dish with spinach, roasted red peppers and tomatoes – Tuscan Linguini I think it was called. But there were also plenty of salad options too. Supper tonight will be left-over Asian Coleslaw (recipe yesterday) with a Rice Bowl from Refresh cookbook. Here’s the recipe for Dragon Rice Bowl (it calles for Tofu, I’ll be using shrimp instead). Grill the zucchini, tomatoes and shrimp in the oven (or on the BBQ) at medium to high heat, until lightly browned. Put 1.5 cups brown basmati rice in each bowl. Pour 1/4 of the Tamari Gravy on top of the rice. Divide the grilled veggies and shrimp into 4 and put on top or beside the rice. Garnish with cilantro (parsley), green onions (chives) and sprinkle with toasted sesame seeds. Gently heat butter and oil over medium heat. Slowly stir in flour until a smooth paste is formed. Cook for 1 minute stirring constantly. Still stirring, add water little by little, to form a smooth thick sauce – I use a whisk to help with this stage. Add tamari, still stirring constantly. You may need to add a little more water to achieve desired thickness. But this usually takes a few minutes (1-2 minutes depending on the flour used) after the gravy has come to a boil for the flour to thicken to the desired consistency.